With this poster we also received a flyer with some information about Mons. Schuler which is worth quoting. “Latin High Mass had never been discontinued at Saint Agnes in spite of an erroneous interpretation of Vatican II which abolished Latin Masses in favor of Masses in English and congregational singing throughout the United States. To quote Monsignor Schuler, as he wrote about the Mass and the music at Saint Agnes, ‘The Council established clearly that music is an integral part (pars integrans) of liturgy; it is liturgy. Two requirements were demanded; music for the liturgy must be sacred and it must be art.’ Soon Saint Agnes attracted more and more worshippers who wanted to attend a reverent and solemn Novus Ordo Mass in Latin, with a liturgy graced by Gregorian chant and traditional artistic music. Monsignor Schuler said, ‘It is through art that man comes to God. Music, architecture, painting, sculpture…all can be means of grace and prayer provided that they are worthy of the Creator of all art and holy as He is.’ There were 18 Chorale Masses with orchestra in the first season along with 4 Masses in Renaissance polyphony. The project from the beginning was funded by the Friends of the Chorale and was never intended to be funded by the parish. The music of the Chorale and orchestra continues to this day. In 2016-2017, its 43rd season, the Chorale will present 29 Masses for the liturgy at Saint Agnes. 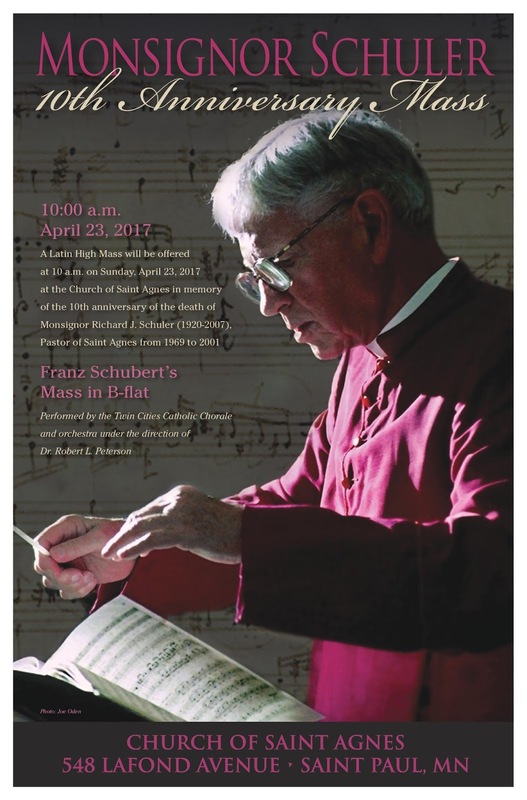 In 1976 Monsignor Schuler became the editor of Sacred Music magazine, a publication of the Church Music Association of America and the oldest church music journal in the United States, a position he held for over 20 years. The journal became his forum for combatting the direction that church music had taken. He is credited by its current editors and the officers of CMAA for keeping the rich heritage of Catholic sacred music alive and for promoting a sacred and reverent liturgy directed toward God. When Monsignor Schuler became pastor at Saint Agnes, he established the practice of praying for vocations at Sunday Mass. He also encouraged vocations to the priesthood by meeting on a regular basis with seminarians who sought him out and by inviting these seminarians to experience the liturgy at Saint Agnes by singing in the Chorale. There are 38 priests who were influenced by Monsignor Schuler on the recently established list printed in this document. Two of these priests are now Bishops and one is an Archbishop. Five permanent Deacons were also ordained for Saint Agnes.